I'm not in the mood to write a lit post, possibly because I'm headed off to San Francisco this weekend. (Readers in the area, if you're free on Saturday and comment with a place and a time before we head out, my friend and I will try to meet you there for coffee.) So, in lieu of anything serious (something serious is planned, incidentally), you get a picture instead. 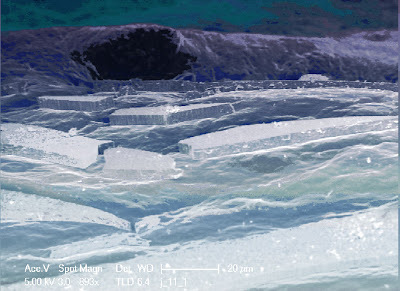 This is from an SEM image taken last week. All I did was add color. The SEM is, by far, my favorite toy this summer. Enjoy the icebergs and the lack of content. Isn't that the Fortress of Solitude? That's a great image. What program did you use to colorize it? Do you love making tips yet? Paint Shop for colorizing. Kyle: not sure quite what you're talking about. oh, kyle. you and your drugs. What was it an SEM of? Or is that classified information? That's obviously an SEM of icebergs. The gaping hole is Nano-Cthulhu. And it's growing as we speak. You should definitely enter this into whatever that MRS contest for images is. It's really really cool. I'm in sf!! My cat's name is psi psi!! Is that a cross sectional SEM? But what actually is it on the picture?